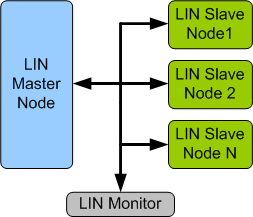 LIN interface provides full support for the LIN synchronous serial interface, compatible with LIN 2.2A specification. Through its LIN compatibility, it provides a simple interface to a wide range of low-cost devices. LIN IIP is proven in FPGA environment. The host interface of the LIN can be simple interface or can be AMBA APB, AMBA AHB, AMBA AXI, VCI, OCP, Avalon, PLB, Wishbone or Custom protocol. SmartDV's LIN IP contains following. The LIN interface is available in Source and netlist products.